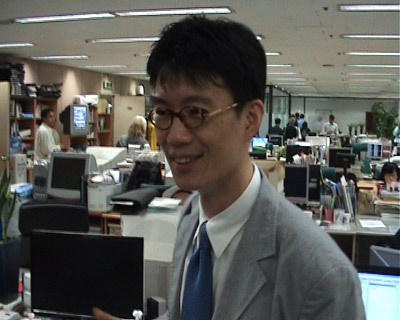 At the end of June, I, along with several other citizen reporters from around the world, got chance to visit the OhmyNews office in Seoul. For those who are not able to visit in person, I'd like to take you on a virtual tour of the OhmyNews office. Ready? OK, now we are in front of Daewoo building, Jongno-gu, Seoul. Let's go inside. On the ground floor of Daewoo building, you can see information about the offices located here. 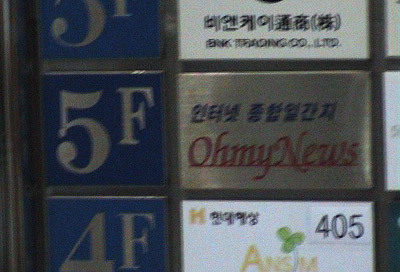 OhmyNews is on the 5th floor. Now let's take the elevator. Let's press the No. 5 to go to the 5th floor. You may be somewhat confused while looking at the floor numbers. In some places, you may unable to find the 4th floor cause the number 4 is considered bad luck. But don't worry, you can find 4 here. ...and here is entrance of the OhmyNews office. Our communication director Jean K. Min guides us inside. 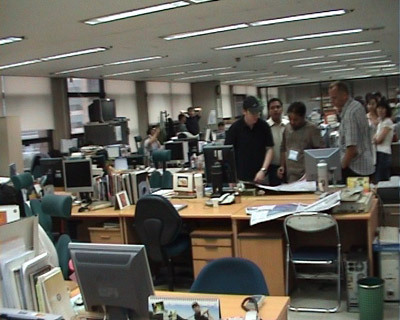 The office is composed of a large space with many computers and staff. 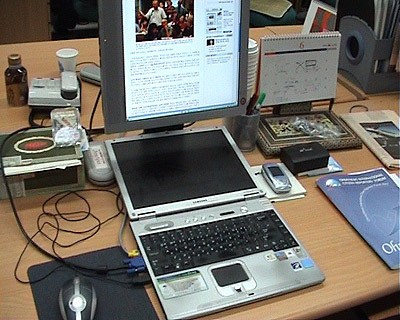 All are busy at work, mostly at their computers. After all, this is online journalism. They are working quietly. I hope we are not disturbing them. Now let's go to a room in the right corner. Jean is about to show us something really interesting. Lucky ones! Photograph of those citizen reporters who took part in first forum in 2005. 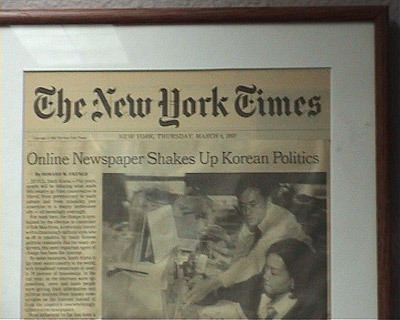 The New York Times coverage about OhmyNews. That was part of the first coverage by international media where the international community learned about one of the most successful experiments of citizen journalism. Now let's look at a different section of the office. OhmyTV department. This section is responsible for live webcasting and video stories that can be watched on OhmyNews site. 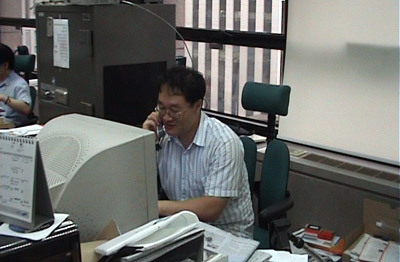 The person on the phone is the head of OhmyTV -- Mr. Kim Do-gyun. He was very busy during forum as he was in charge of webcasting the forum session live. He was very friendly and gave me lots of ideas about how webcasting is different from broadcasting. I was a little shocked when he told that he knows about me. It's probably because I had sent a number of videos to OhmyNews. 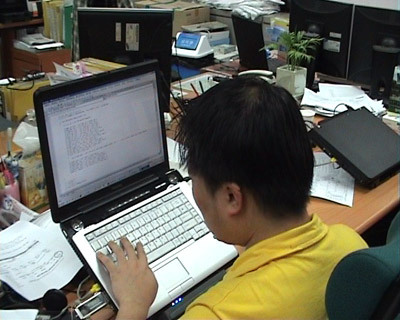 OhmyNews engineers: Since OhmyNews is about to launch a very big project -- OhmyNews 2.0 -- they are very busy working on it. 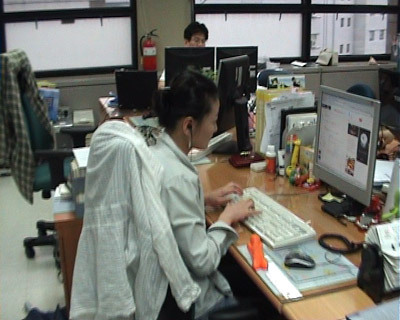 A web designer at work. They are responsible for revising the site. OhmyNews International: This is the section which handles more than 3,000 citizen reporters from around the world. You can see our senior editor Todd Thacker (left) as well as another editor Shane Tasker (right) working there. Besides this international section, there are lots of editors and staff reporters for the Korean version. And finally, here is the magic box -- the computer from where our thousands of stories have been edited. Yes, this is Todd's computer. I was particularly interested to see this and when I asked him about it he said, "I'll probably need a bigger monitor now."